This has been a season of close calls for Oxbridge Academy. Despite the teams 3-6 record, they have lost five of those games by a combined 11 runs. On Wednesday, the Thunderwolves were again in a position to possibly lose a tight one, but this time they came through win a run in the sixth inning to defeat district rival Benjamin 1-0. For most of the way, the pitchers dominated in this one. 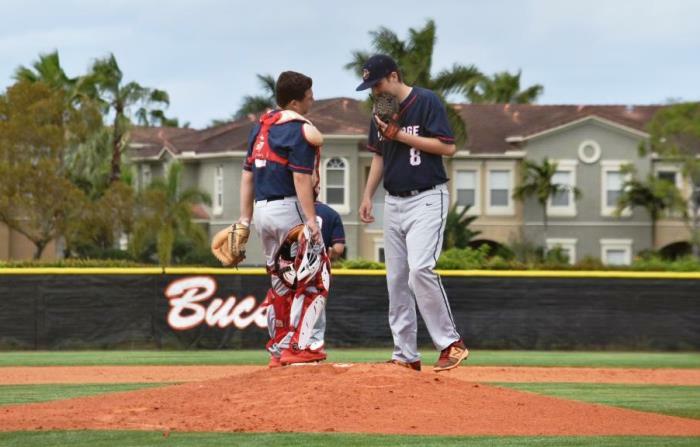 Juan Salinas-Bentley started and went six shutout innings for Oxbridge. Benjamin’s duo of Parker Haskins and Nick Litz were just as good, tossing seven innings combined, and giving up only five hits and the lone run in the game. The Bucs actually had the first scoring opportunity of the game in the bottom of the second. Tyler Judge singled, and after a flyout, Nico Bechtold also singled, putting runners on first and second with one out. Salinas-Bentley struck out Litz, but an errant pick-off play moved the runners up to second and third. The Thunderwolves then worked out of the jam with a strikeout. In the third, Oxbridge had their first threat of the game. Gio Richardson hit a one-out double, and after a strikeout, Jake Mills walked. Haskins then wiggled out of the jam by getting Drew Beno to hit into a fielder’s choice. The Bucs put the first two batter on in the fourth, when Haskins and Judge both singled. As was the case throughout the day, the Benjamin offense couldn’t come up with a hit to break through on the scoreboard, and the rally ended with two strikeouts and a groundout. In the fifth it was more of the same for the Bucs, Brian Lopes and Vance Sheehan had singles and were stranded, mounting the frustration for Benjamin. In their half of the sixth, Oxbridge finally broke the scoreless tie. Dylan Symonds doubled, and Taylor Herman became the designated runner at second. It looked again as though Benjamin would survive without giving up a run, but after a groundout by KC Anchors moved Herman to third, a balk brought in the first and only run of the game. Mills then came in relief in the seventh, and closed the door, giving Oxbridge the win. The Thunderwolves are hoping this game is one that turns their season around, but they will not have much time to celebrate. On Friday, the Thunderwolves head out on the road to face the #3 team in the county, Saint John Paul. Benjamin, who came into Wednesday having won three of their past four games, will also face a district rival on the road Friday in Kings Academy. Then, the Bucs have a matchup with the top team in the district and county, American heritage.